Remember not long ago when we had the special toast? You know, famous images seemed to appear on toast and be claimed as a divine sign…or a tasty lunch. I don’t think we milked that concept enough so I’ve had the gnomes busy on coming up with…. 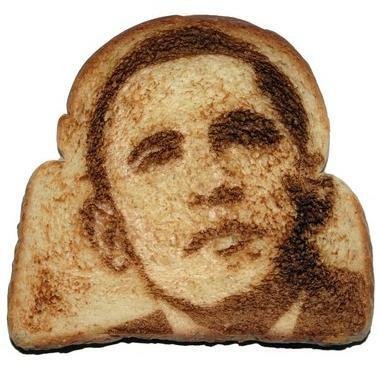 That’s right…bread that toasts into famous historical figures and celebrities. Thanks to invisible chemicals sprayed on the bread you too can be amazed that the images that toast up. We offer many special themes or just take a grab bag. The infamous people loaf is a great one for the inlaws. 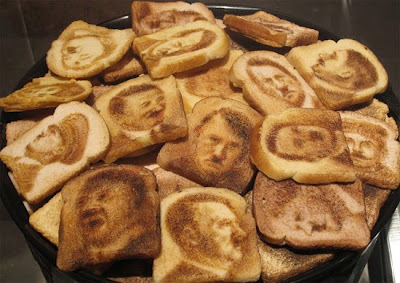 Imagine serving a nice BLT with Hitler burned into the toast to your mother-in-law. The possibilities are endless. Yes, Miracle toast…I’m telling you…this is the best thing since…well…sliced bread. The possibilities are endless! Now, who to have on my french toast tomorrow morning! This afternoon I was in a store that sold things to press on your bread to make the image as it was toasted. Were you there too? Better yet, here's a piece of toast with one of those 3D images on it. That second picture is seriously scary. Is it true that if you take some melted butter and paint a picture on with it before you toast it, you can get a picture, as long as you do not burn it? Not sure if that is true but I remember seeing it somewhere. And if you slightly press an indentation into the bread then it also gives you a pic. I wonder if either of these works, but maybe you should invent something that does make pictures on toast, and you might be able to stop working. I'd like to see Dolly Parton immortalized in toast. Then I'd like to see the size of the loaf it came from. This is a product I'd actually buy. Who is that bearded man in the first piece of toast?? Could it be??? Nah. Can you make it so you can write things on the toast? That could make breakfast interesting! I still have a silly Mickey Mouse toaster that imprints the rodent's image on the bread ( and plays the show theme...you know the one ). X-mas present from a few years ago. NEVER USED! I swear! you could get revenge on hitler by putting his face on slices of jewish rye and turning him into a reuben. yeah, bad idea....i'll be leaving now. Let's try that again without the typos! Yeah, who is that in the first shot? At first glance I thought it was Leon Redbone, but there's too much beard and it's the wrong kind of hat. Mrsupole – Any image on bread is scary! Dale – You need a bread that can rise to that challenge! Lime – Now see…if I had said that I’d get a whole bunch of flack for it! I don't eat butter on my toast. Actually, I don't eat butter at all. I'm not saying POTUS is on Wonderbread or anything, but that's definitely not rye, you know? I am laughing so hard over Dales comment, I can't think of anything clever. Who would I LOVE to see on my morning toast.....maybe Tony Horton, then I could count it as both my work out and breakfast. Don't mock the toast. You have been warned. Can I preorder a loaf of Mother Teresa flipping the bird? Will email you my neighbours credit card details. Actually, the already have a gadget out there called Holy Toast...puts an image of the Virgin Mary on your toast. Oh, how I wish!! ROFL! You could have self-portraits done, or you could have your enemies' pics burned in so you could eat them. Personally, I'd choose Johnny Depp, but for a different reason entirely. I don't need to spell that out, do I? hummmmm one with ummmm ok I dont know what it would take to freak me out should I find one.